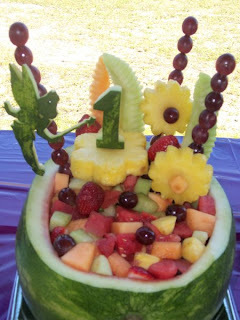 This is fruit bowl for another kids party, this one has a Tinkerbell theme for a one year old. Tinkerbell is flying around a fruit flower arrangement with the number one carved out o f Watermelon. 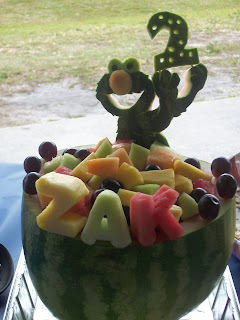 A fruit bowl made out of watermelon and carved to look like Elmo for a kids birthday party.